Growing up in a very small town in the 50’s and 60’s leaves you with so many fond memories of your childhood. This town was very much like Mayberry on The Andy Griffith Show. Everybody knew everybody and their kids. We had our local barber, pharmacy, dry goods store, five and dime, cafes, shoe shop, etc. It was a thriving community and spending Saturday afternoon in town was an every week ritual for our family. We only lived about a mile outside of town but the whole family, grandparents, aunts, cousins, everybody went into town on Saturday night. Hubby and I grew up in the same small town, so we have some of the same memories of what it was like. Our elementary, middle school and high school were all connected at that time. Part of the school was two-story and had huge windows that would be open on warmer days. This is where the yummy comes in……. 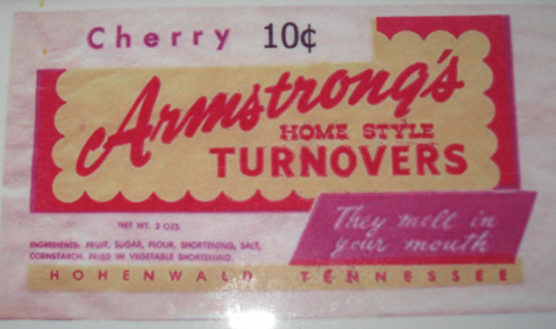 There was a small pie factory, Armstrong’s Home Style Turnovers , on land adjoining the school property. If you were lucky enough to have a classroom on the front of the school building… and it was a warm day….. and the windows were open….and your teacher was in a good mood, you could smell those pies cooking. OOOOOooooo…. sniff, sniff…… yummy. Our teacher, and maybe this was for themselves as much as the students, would take orders, collect the money and send a couple of students over to buy pies. The day old pies were a nickel and the hot ones, just out of the oven, were a dime. That was back when a dime was worth a dime and a nickel was a nickel. The flavors were, apple, peach, cherry, coconut, chocolate, pineapple, lemon and raisin. We could walk right in the back door, a screen door that slammed shut (love that sound), and give one of the cooks our order and the money. What a great afternoon treat that was! We didn’t get to do this every day but it was so special and such a great memory of my childhood. Whenever we would come back for a visit, we lived elsewhere for 30 years, if we found a place that sold these wonderful pies we would have to have one. We even ran into a friend one time, who was also visiting, and she bought every one the store had and was going to other outlets to see if they had any. She has since started ordering them and having them shipped to her and her family. The factory was bought and the operation was moved to another town. 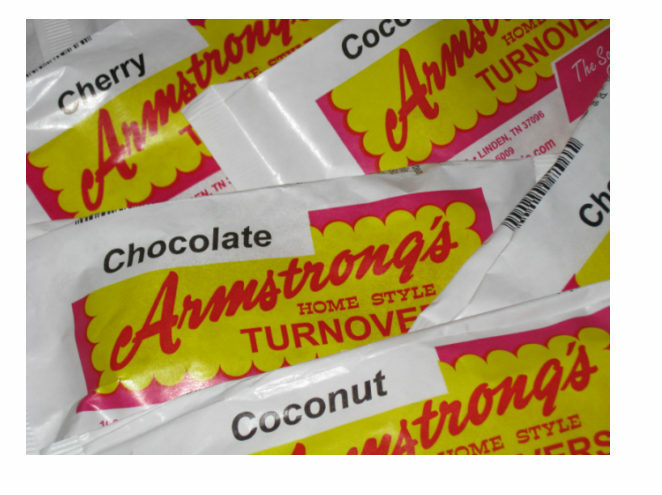 They weren’t quite the same but they still had the same wrapper. That person soon sold it and the next person made a good go at it. They began to be more like we had remembered and then he sold it. Finally it sold to someone who got it right. The wrappers are opaque versus the parchment looking paper it once was, but hey, it’s what’s inside that counts anyway. Now when we go to our cabin or sometimes when we need to bring a dessert for a get together with friends, we buy a bunch of these and savor and devour them. Mostly we buy them for ourselves and get a little selfish!!! You are always a hit with a group when you bring these little devils. We actually used them at our last class reunion as part of the party favors. What a treasure! 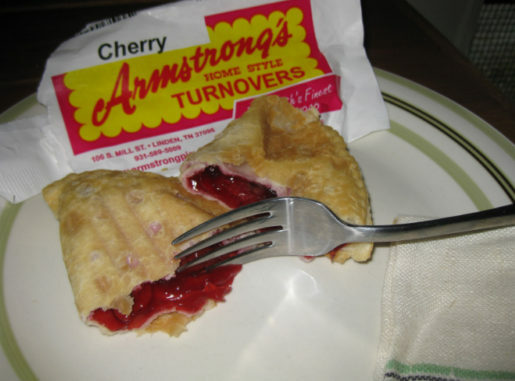 So here’s to the Armstrong’s Home Style Turnovers…..keep up the good work! !